Among other novel histological techniques introduced after Golgi’s reactione nera was the Nissl stain. Nissl discovered the effects of the stain as a medical student in 1884 and he provided a published account a decade later. It involved aniline dye which resulted in a bluish appearance of brain cell nuclei and rendered visible cellular structures that had not previously been visualised. The parts which appeared dark blue were called Nissl substance and are now known as endoplasmic reticulum. Nissl worked with Alzheimer in Frankfurt, and they both moved to Munich in order to advance their researches on brain pathology. He also worked with Brodmann, whose cytoarchitecture was based largely on his studies using the Nissl stain. 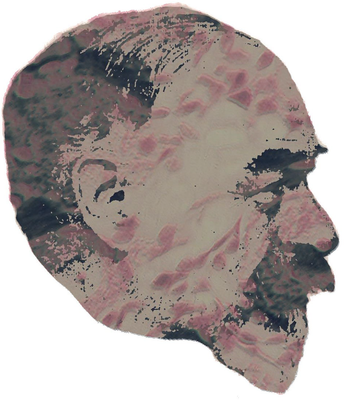 The portrait of Nissl is combined with brain tissue stained by his method.